Minnesota native Amy Thielen, host of Heartland Table on Food Network, presents 200 recipes that herald a revival in heartland cuisine in this James Beard Award-winning cookbook. The New Midwestern Table reveals all that she’s come to love—and learn—about the foods of her native Midwest, through updated classic recipes and numerous encounters with spirited home cooks and some of the region’s most passionate food producers. With 150 color photographs capturing these fresh-from-the-land dishes and the striking beauty of the terrain, this cookbook will cause any home cook to fall in love with the captivating flavors of the American heartland. 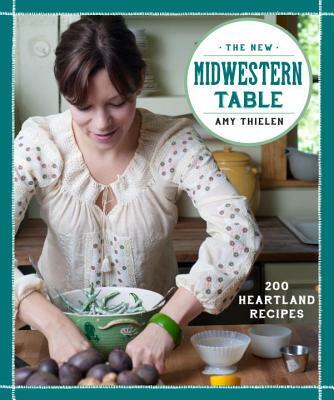 AMY THIELEN is the author of the James Beard Award-winning cookbook The New Midwestern Table and the host of Heartland Table on Food Network. A former New York City line cook, she now speaks and writes about home cooking for radio, television, and magazines, including Saveur, where she’s a contributing editor. She lives with her husband, visual artist Aaron Spangler, their son, his dog, and a bunch of chickens, in rural Park Rapids, Minnesota. "I’m biased on the Midwestern book, as it’s my home turf, but the Minnesotan Thielen, who logged serious years as a cook and chef at some of the best restaurants in Manhattan until she began a family, brings new life to recipes that are so at home in this part of America, dishes featuring our lake fish and our abundant venison, and vibrant takes on pot roasts and meat pies, recipes from simple salads to more elaborate preparations for headcheese and red current jelly."